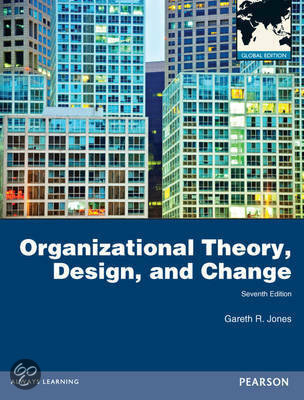 Summary OT&D This is a summary of the book Organizational Theory, Design and Change from Jones (7th edition) for the exam of the course Organizational Theory & Design for Pre-MSc. The summary contains all the chapters of the book (Ch1-Ch14). Summary Organization Theory and Design for Pre-msc Complete summary of the course Organization Theory and Design for Pre-msc. It contains tables (but not all). Summary Organizational Theory, Design, and Change (Gareth R. Jones) Summary of the first 10 chapters of the book Organizational Theory, Design, and Change. The content is based on information from the lecture slides as well as the book itself. Organizational Theory, Design and Change - Summary of book Must have summary of the book: Organizational Theory, Design and Change. Includes also question and answers of the cases in the book. On this page you find summaries, notes, study guides and many more for the study book Organizational Theory, Design, and Change: Global Edition, written by Gareth R. Jones. The summaries are written by students themselves, which gives you the best possible insight into what is important to study about this book. Subjects like OTD, Gareth. Organizational Theory, pre-msc, Organization Theory & Design, theory and design, Organisation Theory & Design, Organisation Theory & OTD Pre-MSc will be dealt with.